Are your social marketing campaigns worth the investment? If you spend hours on your social media outreach but have no idea if it’s successful, you need to have a strategy to measure the return on investment (ROI) from social media. In this article, we’ll show you the quick and easy way to measure social media ROI using Google Analytics. Social Media ROI is the sum of all actions that provide value you gain in comparison to the resources you invest on social media. Basically, calculating the ROI tells you whether the time and money you spend on social media are worth the investment. Now, calculating your social media ROI is not very easy because, at its core, social networking sites are publishing and sharing platforms. You can’t always use it as a selling platform and calculate the ROI by simply tracking conversions. In fact, considering social networks as selling platforms will create an adverse impact and make your profiles look spammy. Rather than solely focusing on driving immediate conversions, you’ll need to look at few other metrics to calculate your social media ROI. Before we dive into the metrics, it’s worth taking a moment to set your objectives for social media marketing. 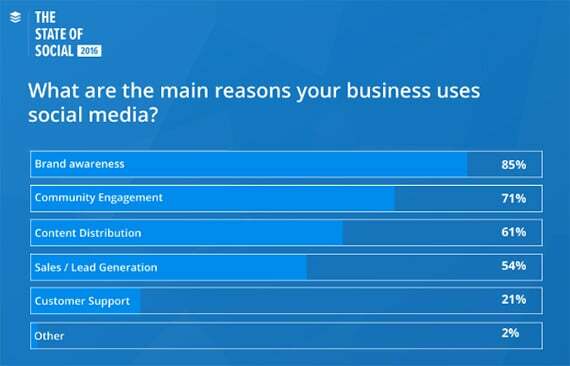 According to Altimeter, a whopping 66% of organizations don’t feel that their social strategy is connected to business outcomes. By setting objectives for social media, you can identify how to connect social strategies to your business outcomes and what you need to track to measure your ROI. Let’s take a look at how you can measure these. While Google Analytics isn’t a complete solution to measure all social media engagement, it provides you with some useful metrics that let you figure out whether your campaigns are helping your business’ bottom line. Let’s take a look at a few important social media metrics that matter to your business and how to find them in Google Analytics. Generally speaking, social media fits in top of the sales funnel, typically in the awareness stage. According to a Buffer survey, brand awareness is the top reason marketers use social media. You can track brand awareness based on metrics like followers count, reach, mentions, etc. Using Google Analytics for tracking social media engagement has its own limitations since you can’t track metrics like follower count and reach of your posts. That means in conjunction with Google Analytics, you’ll also want to use insights offered by different social networking sites to track your awareness campaign. However, the main benefit of using Google Analytics for tracking brand awareness is that the data is not just limited to the post you’ve shared through your profile. For instance, Facebook Insights shows you the engagement your posts perceived that have been shared through your Facebook Page. But it doesn’t tell you how well your blog posts performed if it’s been shared by your reader directly from your site. Owned social are visitors who land on your site by clicking the link you shared on social media. Earned social are visitors who land on your site by interacting with a link shared by your reader. When it comes to analyzing the ROI, differentiating between these two metrics is essential. It helps you to determine the impact your social followers are making on your business’ bottom line. It also helps you figure out the type of content that works best on an entire social channel in comparison to the type of content that works best with your followers. Once you’ve figured this out, you can apply the knowledge while sharing your content with your community. Based on the fact, you can even target or exclude your followers when running an ad campaign. To discern owned social and earned social, you’ll need to tag your links with UTM parameters using our URL builder tool. 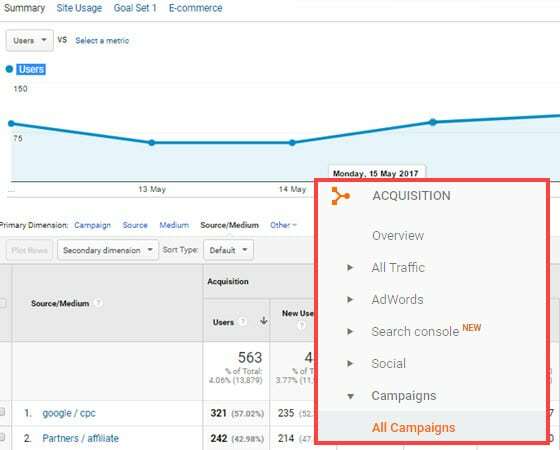 After tagging your URLs, you can review your social traffic in the campaigns report by visiting Acquisition » Campaigns » All Campaigns. It isn’t always possible to focus on several different social channels to drive traffic. For the best ROI, you’ll need to know which social channel contributes the most traffic to your site so that you can particularly focus on that channel rather than spreading yourself too thin. To find which social network contributes the most traffic, you can find the network referrals report by visiting Acquisition » Social » Network Referrals. Depending on your goals, you can use social networks to drive conversions as well. Keep in mind that unlike other marketing channels, you can’t always expect direct conversions from social media. Besides direct conversions, you’ll also need to keep an eye on a metric known as assisted conversions. 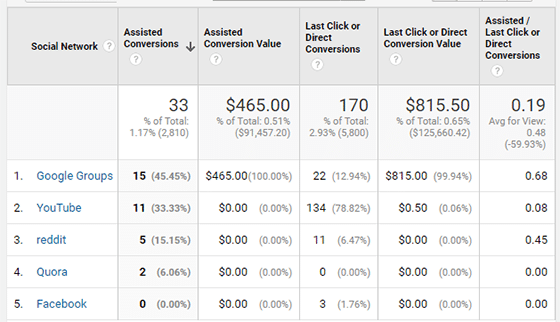 Tracking assisted conversions is the best way to identify the overall impact of your social marketing campaign. It is the total number of conversions that lead to final conversion interactions. An assisted conversion is when a visitor left your site after interacting with your campaign, then came back through another channel and converted. To find direct and assisted conversions report, navigate to Acquisition » Social » Conversions. Google Analytics is not a complete tool to track social media engagement. While it can analyze social media interactions that bring users to your website, it has a less than desirable track record when it comes to social reporting. For better analysis, you might want to track your metrics using a social media scheduler app, like Buffer. The default reporting in Google Analytics isn’t always accurate. For better analysis, make sure to tag your links with UTM codes with our URL builder. If you’re using a social sharing plugin on your site, you might want to measure your onsite engagement to figure out which social plugins users click on your site and which pages they share and like. We hope this guide gave you insights into tracking your social media ROI. Looking for the best way to set up Google Analytics on your WordPress site? Don’t miss out on the data you need. With MonsterInsights, you can accurately track Facebook Instant Articles and easily get the stats that matter.